Junior Achievement program address exactly the fourth competence and are largely considered by government and other stakeholders in economic education. In support of the current curricular reform initiated by the Ministry of Education, Sport and Youth, JA programs will be integrated in the new official curricula of High School as integrated part of Economy, subject at 12th grade. The new JA economic program will include JA elective modules; Business Ethics, Success Skills, Be Entrepreneurial and Personal Finance. This intervention would constitute a unique example among 122 countries worldwide implementing JA programs in schools, as the first case of JA program being obligatory through the whole pre-university education system. The support will ensure a qualitative installation of JA program in the core curriculum, capacity building of teaching staff and sustained involvement of business community in school life. “Leader for a Day” is an initiative of JA and aims to cultivate a new generation of leaders. The closing ceremony of this event was organized on April 17th, 2018, which was opened by Ms. Suela Bala, CEO of JA, welcomed by Mr. Martin Mata, AADF Co-CEOs and Chairman of the Board of JA, followed by Ms. Besa Shahini, Deputy Minister of Education, Sport and Youth, and concluding from a student representing the JA Alumni. 48 new high school graduates experienced a unique day by attending a typical day of work with executives, and dignitaries in the public sector as well as with prominent representatives of the business community in Albania. 48 institutions in the public and private sector participated, 39 of which are strong businesses operating in Albania. Throughout the entire day, students had the opportunity to shadow the executives of the respective companies where they learned more about their roles and overall responsibilities that each leader executes on a day to day function. 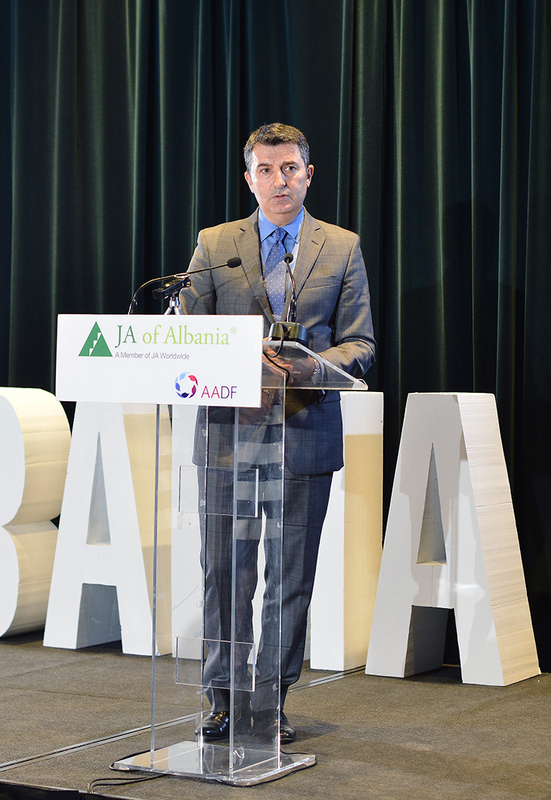 JA of Albania is a program implemented in high schools (general and vocational) sponsored by the AADF.